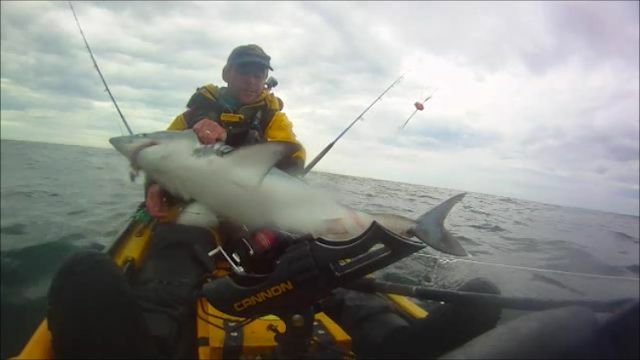 Porbeagle shark from my kayak, well worth the wait. I am back again with more shark mayhem. It was a day of huge disappointment and delight all rolled into one. Well after last year being a terrible year for porbeagle and even the boat men working very hard to get a few sharks, I was hoping this year would be different. So this year I intended to hit the mark where I saw a porbeagle or mako jumping mad after mackerel a couple of years ago. So my son Craig and I hit the mackerel the day before to make a big batch of chum. I cut the mackerel from the back of the head to the base of the gut and use that for chum and keep the rest for bait or eating so no mackerel where wasted. I launched from a shore mark near Malin Head and made my way out. All the way trolling my float and coalie to see would that get any interest. As I went I was jigging for some fresh mackerel and I had no problem finding them, along with some nice bait sized coalies and Pollock to 4lb. Jigging for bait and trolling as I went, but the coalie trolled behind the float soon twisted up quiet badly. So I reeled in and sent it back out again un-baited to let the twists unwind from the line. So a slow paddle and jigging for bait and a reasonable take on the feathers. I guessed a coalie of a couple of pound. 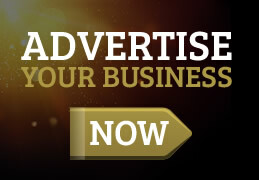 Nothing too exciting in that. Reeling away and the short rubbing leader appeared at the side of the kayak and with that a serious lunge in the rod seen a huge swirl come to the top of the water and the line literally fly off the reel. As it tore off I thought it was a dolphin as the big swirls where coming to the top as it went. It was ripping line off the reel and it rose quickly as it went and it was no dolphin it was a porbeagle shark. It came to the surface with the magical black fin cutting the surface with the tail swaying effortlessly as it went, I couldn't believe it was still on the line. But as it cruised across the surface the shrimp rigs pulled free and away the shark went. 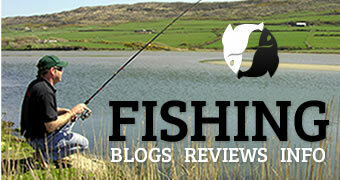 I was on to a friend of mine Alastair Wilson ( Shark pro) to see what he thought. 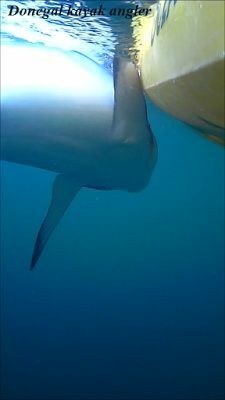 I hoped they were like tope and would come back so I had to ask the shark pro what he thought. He reckoned I had a good chance of him returning so I dropped the anchor and got the chum going. A nice big live mackerel was sent out and the wait was on. I sat there for 2hrs and the tide was dead where I was and the chum was not going out well at all, so I upped anchor and headed off shore to find some better flow in the tide. Shark gear out, chum flowing all over the place so hopes where still high. I was thinking that may well have been my only chance of the year of hitting a porgie so there was I hoping that wouldn't be the case. So the shark lines out and a bait rod out for a bit of fun while the wait was on, but the place was heaving with doggies and I mean heaving. Every drop doggie, doggie, doggie. I gave up on the bottom and just jigged for mackerel. Chum buckets, one drilled and one not to stop it spilling in the car that went by in the blink of an eye and my 10L of chum was well washed out. So I buoyed off the chum bucket and went in search of more stuff to use for chum. Enough bait fish caught and I headed back out to the bucket, all the way praying hard to see a big fin circling it. No such luck. I tied on again, lines out and started the process again. The dribbles from the earlier batch was still in the other bucket. I mixed it all together and refilled the bucket ready to deploy. Chum in and what a sight a huge cloudy plume filled the water. No sooner had the plume washed out in front of me and the balloon on the heavy rod start wobbling and heading off to the right. I reeled the light rod up and just had the feathers sitting there until I hooked it. But the wobble stopped and the live bait rod started going but it also stopped. I reeled it in quickly and started to see if he was still at the ballooned bait. I started reeling but the line wasn't coming from where the balloon was it was heading up behind me and circling behind me. What the hell. No real pressure on but there was something there. I kept reeling and my leader appeared from under my kayak. Up the leader came and I was thinking it was a small spurdog or something. 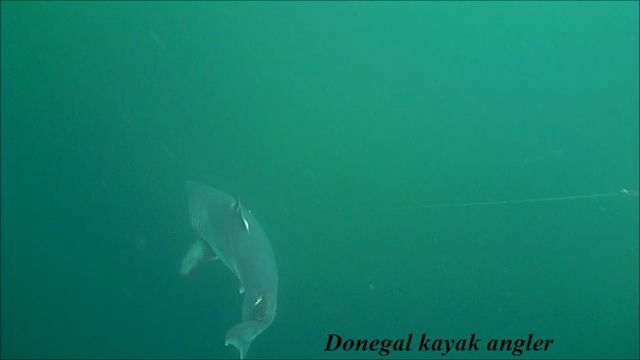 Then the swivel appeared from under the kayak which was at the end of the 1.5m wire trace. Dam it I thought and reached into the water and grabbed the swivel. No sooner had I touched the leader the above happened in that order. What was on my line took off whack my kayak with his tail, smashed my prized Hiro rod in half and walloped everything as it went. Now the bugger was still around my anchor line and now had half my favourite rod attached to it as it poured line off the reel. There was no mistaking it now it had to be a porgie. On the video below you can see me heaving away trying to get it to come up and I was as surprised as you probably where when it came up. I was expecting a bigger shark but she was big enough as I was on my own and I had to get the classic trophy pic. But I had to get her on first. I got her alongside about 5 times and she was very hard to hold onto. Eventually I got a grip of her and dragged her on for unhooking and a few photos. She definitely was the most difficult shark to handle. There very ridged body meant you have to haul the whole weight of the shark on. Not like a tope or a blue that just slides onto the kayak. Up she came onto my lap and she lived up to her reputation in biting everything that touched her mouth. She bit my paddle, chum bucket rope and my foot rest guides. Scary and cool all at the same time lol. So that was that another fantastic and eventful day afloat. 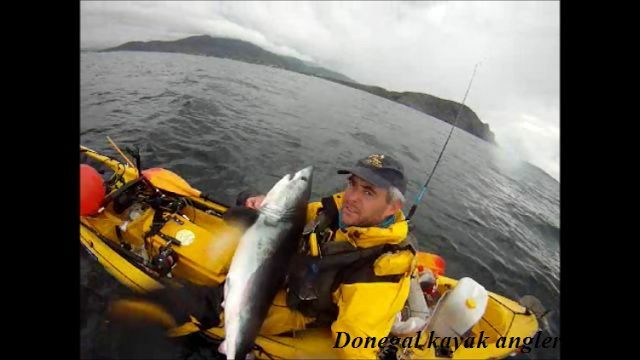 I was delighted with my Porbeagle shark she was around 50lb and an ideal size for the kayak. The after math, anchor line, braid from the bait rod and an unfortunate mackerel. That was my shark trio in just 2 weeks my son Craig's first kayak tope, then my own Blue shark and porbeagle so extra happy with all that.